Click here for the step by step instructions of use. Eliminates the need to dilute blood in a separate test tube because it incorporates its own container. Eliminates aerosols! Saves processing time! Reduces disposables! Description: The SEG-SAFE™ is to be used in Blood Banks for the purpose of safely accessing fluid from a segment, creating a cell suspension, and dispensing calibrated drops. The device is comprised of a protected stainless steel cannula for puncturing the segment, a soft plastic body for holding the cell suspension, and a spout for dispensing calibrated drops. The device is NOT sterilized. Indications: This device is intended as a safe and efficient means to process segments in the Blood Bank for blood grouping/typing or cross-matching. The device can be spun in standard centrifuges for 12x75mm sized test tubes. Contraindications: This is a single-use device and is NOT designed to be cleaned and reused. The device is NOT designed to be used in automatic cell washers. The SEG-SAFE™ is NOT sterilized. Disposal: The SEG-SAFE™ should be disposed of in appropriate bio-hazard containers. 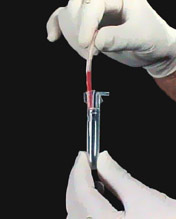 Limitations: Hemolysis may occur when using this product, The likelihood of hemolysis increases if the blood in the segment is clotted or if the segment is excessively squeezed during piercing. WARNING: WEAR GLOVES. FOLLOW CDC AND OSHA GENERAL INFECTION PREVENTION GUIDELINES. Click here to go to the Orders Page.